I hope you’re wrapped up warmly as the weather has taken a decidedly chilly turn! Please take care over the weekend but be sure to get out and enjoy frosty Edinburgh at the same time. We’ve been busy in school as always with highlights including P7 and P2 visited the residents at Trust Housing Association on Montrose Terrace to perform some Scots songs and poems. The residents thoroughly enjoyed our visit, particularly joining in ‘O Flower of Scotland’ at the end. It was great to see the P2s and P7s performing so confidently to an appreciative audience. We look forward to returning soon for a follow up visit. P7s have also been running the Healthy Tuck shop which is proving to be very popular. This runs Tuesday – Thursday with a variety of healthy snacks on offer. Favourites this week have been the strawberry and blueberry cups! Next week, P7 will do a snack-swap event so look out for more details when we come back to school on Monday. On Tuesday, there will a small bake sale for P4-7 which has also been organised by P7, with all funds going to Cancer Research UK. Cakes will cost between 20p and £1 and the P7s will talk about this further in assembly on Monday. On Wednesday, Mr Martin held a meeting with P6 parents to discuss their trip to Lagganlia in September when they will be in P7. It was a good opportunity for parents to ask any questions and find out a bit more about the activities that the children will do while they’re at Lagganlia. Everyone is excited already! Please check your emails or schoolbags next week for more information if you were unable to attend the meeting. Next week, it’s Safer Internet Day on Tuesday 5th February. We’ll be using this opportunity to have conversations across school on what a great place the internet is, but what dangers can also lurk there. If this is a subject that causes headaches in your house and you’d like to get a bit more information before chatting to your child, have a look on the Safer Internet Day website. There are areas of the site that you could look at with your child, including this Safer Internet quiz which is all about consent in a digital world. Please remember that next Friday (8th February) we break up for the February half term. School and Nursery resume as normal on Monday 18th February. This entry was posted in Fundraising, Head Teacher's Blog, P7, Primary 2, Primary 7, Uncategorized and tagged Camp, Enterprise, Fun!, Head Teacher's blog, Online Safety, Performance on 01/02/2019 by S Ketchin. We have just welcomed our P7s back from Lagganlia and there were lots of tired but happy faces as they piled off the bus! They have had a great time and it’s been fun to watch their adventures unfold on Twitter. Everyone took part in new and exciting activities and developed new practical skills as well as teamwork and resilience in the face of challenges. Thank you to Mr Martin, Miss McCourt and Miss Chmielecka as well as all the instructors and staff at Lagganlia for delivering such an unforgettable week. Meanwhile, back at Abbeyhill we’ve had an exciting week too. Primary 1 had their first Woodland Wednesday where they spent the morning in Holyrood Park building slides, tents and making patterns with natural materials before coming back to school and taking part in Loose Parts Play for the afternoon. You can request to follow Mrs Lansdown and P1 on Twitter if you’re a P1 parent (or associated with the class) and keep up to date with everything that goes on through their daily tweets. Loose Parts Play was introduced last year at Abbeyhill and is popular with the whole school. P5 and P6 Play Champions help staff to put it out and away again and for two lunchtimes a week there are crates and tyres being used for all kinds of exciting things in the playground! Our new sandpits, kindly built by the Parent Council, are also very popular and this week some of the children worked together to create a sand sculpture inspired by what they could see from the playground – Arthur’s Seat. We’re so very lucky to have such a beautiful view. P1, 2 and 3 invited parents and families in for Shared Learning on Tuesday morning and it was lovely to see that so many families were able to make it into each class. With Parent and Family Night approaching, it will hopefully help to give families a little bit of context when discussing their child’s learning as they will be able to picture the classroom environment and learning in progress. Shared Learning events will happen regularly throughout the year. P6 attended a basketball tournament at Drummond Community High School on Wednesday with the other cluster primaries, Broughton and Leith Walk. The tournament was part of our wider transition work to prepare children for moving up to high school by giving plenty of opportunities to spend time in a high school environment. All the P6s enjoyed the experience of working with different staff and mixing with the other children in the cluster; thank you to all the staff and pupils at each school for working so hard to organise such a good event. 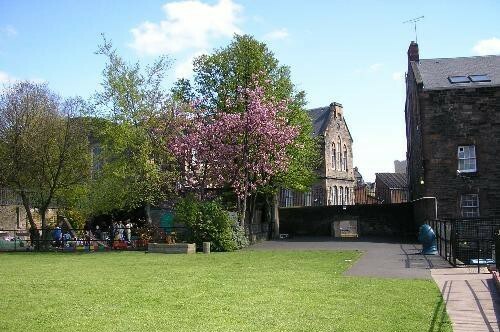 Next week is our last week before the October holidays and P7 are going for breakfast and a treasure hunt at Drummond – check back next Friday to find out more! This entry was posted in Head Teacher's Blog, P7, Parent Council, Parental Involvement, Primary 1, Primary 2, Primary 3, Primary 7, Uncategorized and tagged Head Teacher's blog on 05/10/2018 by S Ketchin.